Over the course of a few visits down to the Southeastern region of the country, Terrapin has become one of my go to breweries when picking things to take back to home base. I know they’re not the most trendy of picks, but so far I’ve really liked all the beer I’ve had from them. With that in mind, it only seems appropriate that I end my series of vacation beers with them. 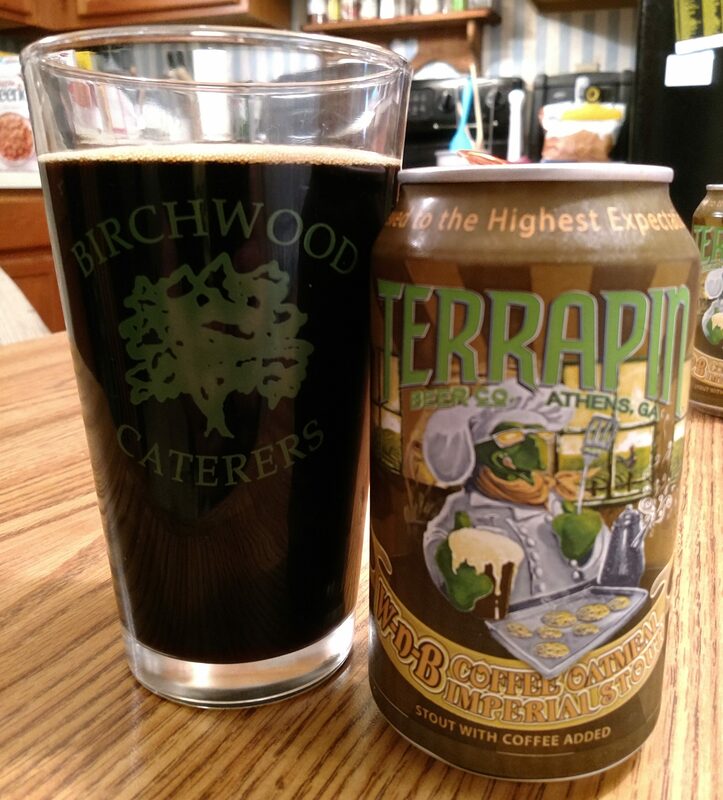 Description: An oatmeal stout brewed with coffee from Atlanta, GA based Jittery Joe’s. You can find the full specs here. Appearance: It poured to a thick black body topped by a thin tan layer of foam. Smell: A sweet and grainy blend of oatmeal and dark malt with light roast coffee in the background. Taste: Sweet and creamy right from the start, this rather inviting opening was followed by dark malts and oatmeal grain mid-sip before taking on some light roast coffee and a bit of heat on the finish. Mouthfeel: The body was on the plus side with a low-level of carbonation. Hype: Personally elevated. In addition my affinity for the brewery I have also heard a ton of great things about this beer over the years. Overall: Very good. This one met my high expectations and was an excellent beer to end our trip with. Hi everybody! The BeerRantsAndBooks family is currently on vacation and will be out of town until the end of the month. I won’t be posting for the reminder of my trip but rest assured I have plenty of great content on the way. One of the great things about visiting family is that it gives me a chance to not only check out some out of market beers, but I also get to catch up on my reading as well. See you in April! For Part Two of my 2018 retrospective I am going to look at the beverage portion of my blog. I feel like I occasionally struggled in this area last year and there were at least a few times I got pretty burnt out on reviewing beer. After some reflection on why this was happening, I realized that I was spending too much time chasing beers solely for making a review and not paying enough attention to what I actually wanted to drink. I blame no one but myself, but I think NEIPAs in particular got me into that situation. Yeah, they’re popular and tend to have names that sound like they’d be fun to post about, but the reality is that there are a lot of incredibly similar, perfectly-fine-but-not-inspiring examples of this style that are for the most part indistinguishable. At one point I felt like was just writing the same review over and over again and quite honestly failed to find joy in it. To break myself out of this rut, I started revisiting some old favorites and even (gasp!) sat back and drank some beer without having any intention of reviewing it. I’ll say it now that some of the best beers I drank last year didn’t even come close to making the blog. In previous years I would have been incredibly disappointed by this, but with my current mindset I couldn’t be happier with the results. Having said that, reviewing beer is something that will still be a central part of my blog, but it may look a bit different going forward. I was already not one to chase the latest and greatest (not to mention rarest) brews available, nor do I have the luxury of regularly hitting up breweries. Instead, I am going to focus more on personal tastes and quality over my previous desire for quantity. It may mean fewer posts, but I am confident it will be a better experience for me. I’m sure my wallet and waistline won’t mind, either. With the exception of the final spot, I probably could have guessed these results. That the top two spots went to releases from the popular brewery in my area was certainly no surprise, and the brew taking top honors was certainly much sought-after. The same could be said for Beelzebub and Fruitallica was a national release from a well-known brewery with some crossover appeal on account of the name. And that leaves the Central Waters Barleywine which was my one minor surprise. To my knowledge this isn’t a particularly popular beer, but considering how good it was, I am certainly happy it got the attention. Well, there you have it. My 2018 year in beer. I hope you all join me for a few pints in 2019 as well! 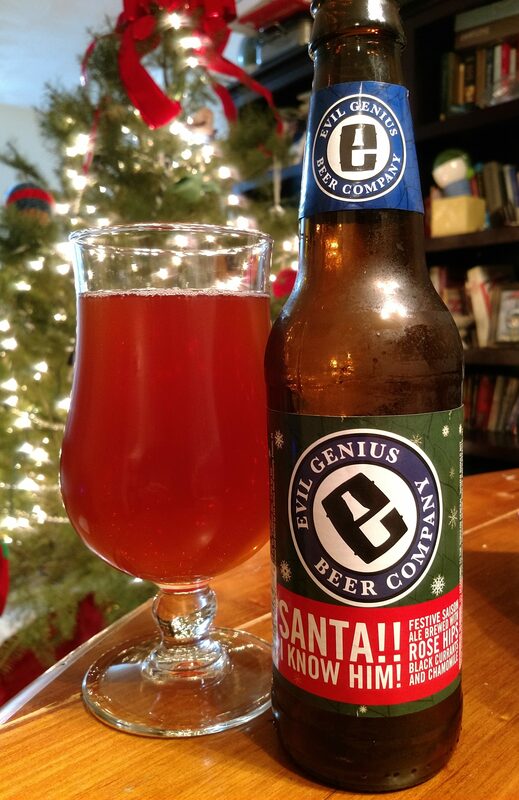 The Twelve Beers of Christmas, Day Ten: Evil Genius Beer Company – Santa!! I Know Him! Since this is what the name made me think of, I now turn my introduction over to the comedic stylings of Cheech and Chong and their beloved holiday classic, Santa Claus and His Old Lady. It’s too long to put full script here, but it’s definitely worth a listen. Chong: Wow, did you know these people, man? Beer Name: Santa!! I Know Him! 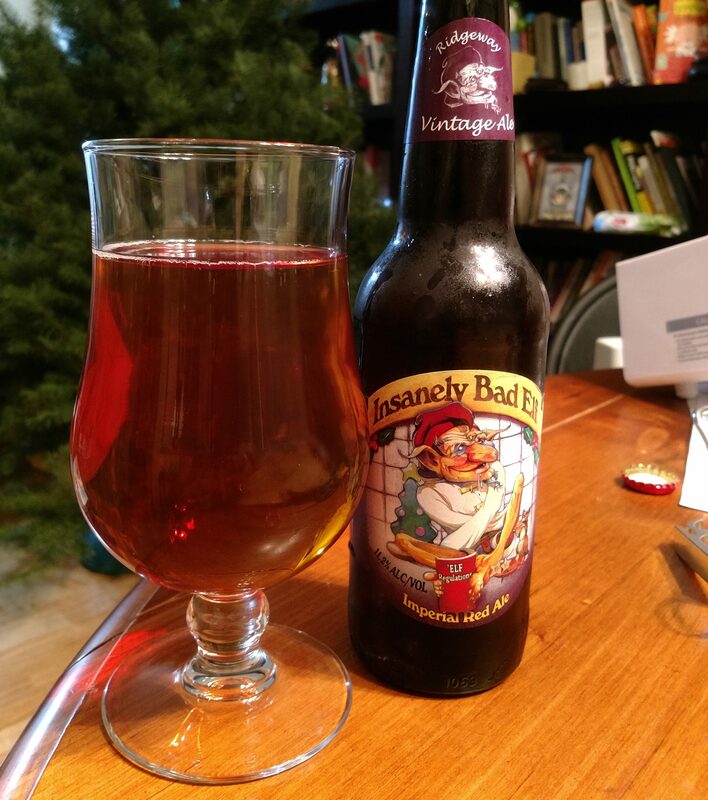 Description: A holiday saison brewed with rose hips, black currants, and chamomille. Get the full story here. Appearance: Poured a slightly reddish, caramel colored body with no head. Smell: Light earthy sweetness with subtle hints of peppery yeast in the background. Taste: Started out with that same earthy sweetness (presumably from the currants) that I mentioned above. The initial sweetness was followed by a dry tea flavor and a moderate peppery yeast presence. Dry and ever so slightly tangy on the very end. Mouthfeel: Just shy of medium bodied and very bubbly, especially when first poured. Hype: Like the rest of the beers in this series, none in particular. I bought it for the name. Overall: I was a little unsure about this one going in but ultimately I quite liked it. The carbonation was a bit too strong at first but after giving it a minute or two to settle this was drinking great! Great subtly and balance despite all the flavors going on. Happy Winter Solstice everyone! When looking through the haul of beers I grabbed for this review series, which in all honesty was mostly compiled in one grab through the singles section at one of my local stores, it seemed like this one had a particular day I should drink it on. Description: A seasonal beer brewed with a variety of malts and hopped with Fuggle and Golding. Appearance: Reddish light brown body with a lacing of white bubbles across the top. Smell: Faint hints of toasted malt and sweetness. Taste: A mix of caramel and lightly toasted malt upfront. A light, earthy/spicy bitterness came on about midway and mingled with more toasted malt for the ending. Hype: None really, but I have had some quietly delicious stouts from this brewery. Overall: Not bad a brew, but somewhat underwhelming. I personally would have welcomed in winter with something a bit more robust, but it was the luck, or not, of the draw that put this in my glass. Decent malty ale, but ultimately nothing to write home about. Moving right along, we’ve hit our first beer officially labeled as a “Christmas Ale.” Starting to feel pretty festive around here. Description: Listed on the company website as a brown ale, this seasonal offering was brewed with a broad mix of malts and hopped with Columbus, Cascade, Centennial, and Amarillo. Check the link for the full details. Appearance: It had a transparent deep amber body topped by a fluffy light tan head. Smell: Sweet caramel malt with a light piney bitterness in the back. Taste: Started out sweet with caramel malt and maybe a hint of citrus. It had a biscuity middle and finished with a slight piney bitterness that mostly hid herbal wintry spices on the closing of the sip. Hype: I always have a soft spot in my heart for Abita. Drinking them at home is not the same as doing so in New Orleans, though, but what can you do? Overall: I enjoyed this one a lot. It’s not the kind of beer that is going to wow you, but it had a flavor profile I tend to really enjoy. I’d definitely pick this up again and, if was going to any holiday parties, would bring along a six-pack to share. Elves seem to be a popular choice for beer names/images this time of year though, oddly enough, few if any seemed poised to make the Nice list. I figured I’d start out on that particular theme with perhaps the naughtiest of the lot. Appearance: Translucent reddish/copper body with no head either on the pour or as the beer settled. Smell: Caramel malts with warm, boozy undertones. Taste: Very sweet upfront, with brown sugar and the candy-like Belgian yeast coming in right from the start. Toffee and a bit of lightly toasted malt came in around mid-sip with a warming bit of alcohol paired with subtle spice (and maybe a bit of vanilla) on the end. Mouthfeel: The body was just shy of thick with a moderate level of carbonation. 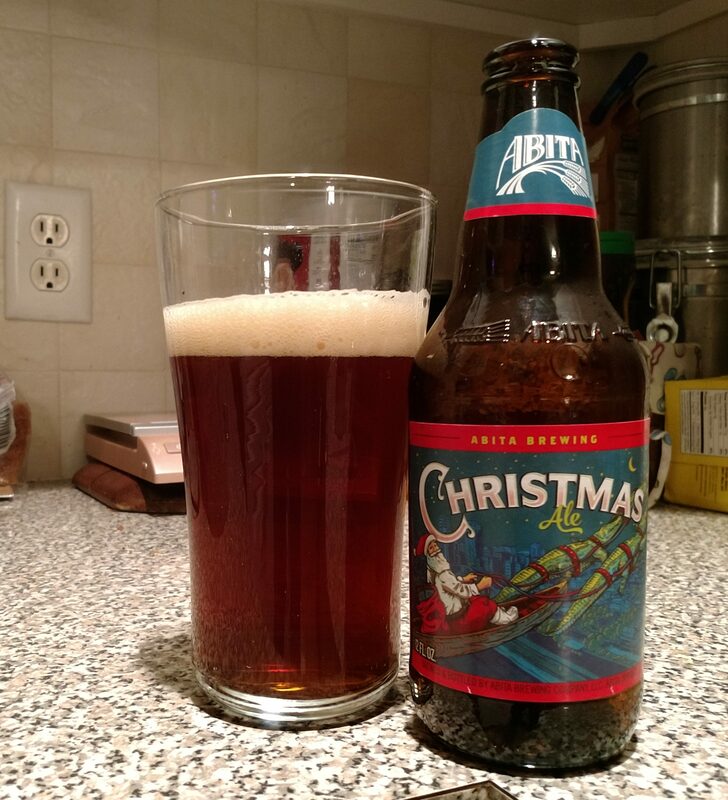 Hype: This was one of the first beers I picked up for my holiday series, so I was a bit excited about it for that. Beyond that I had no idea what to expect from this brewery or what this style meant to them. Overall: This was a heavy, warming brew that really grew on me as the glass went on. I was caught totally off-guard by the first sip, but by the third I knew I was in for something tasty. It came close to be too sweet at times, but the light toastiness and warmth always seemed to pull it back from that edge. I’m glad it came in a small bottle, but I would definitely look for this again on a cold night. I know I’m a few days late with this greeting, but I feel like that’s pretty unavoidable this time of year. I’ve long held that Halloween marks the last chance to truly let loose and have fun before the mad rush through Thanksgiving, the December Holidays, and New Year’s and that seems especially true for me this year. I’m not saying there’s no fun to be had from these things (indeed I have a newfound appreciation for these holidays upon experiencing them with a two-year old), but this time of year certainly brings with it a level of stress and obligation that can really weigh one down. On account of this I haven’t had as much time to work on posts as I would have liked and am taking a week or so off to gather my thoughts while preparing to end the year strong. I have one more epic book review coming up that I am very excited to share with you all and on our around December 14th I have a festive lineup of beers I’ll start reviewing. I also have some end of year type posts in the works, though I will have to wait and see whether or not those make the December cut or get pushed to early January. It’s a hectic time of year right now, so I’ll close this with a reminder to be careful out there. Stay warm, safe, and sane my friends! This was actually kind of a sad review for me and it’s one that I’ve been putting off for a little while. I’ve written briefly about the closing of Pretty Things here before, but this time my review comes with a bit more finality – this was my final bottle of their beer. 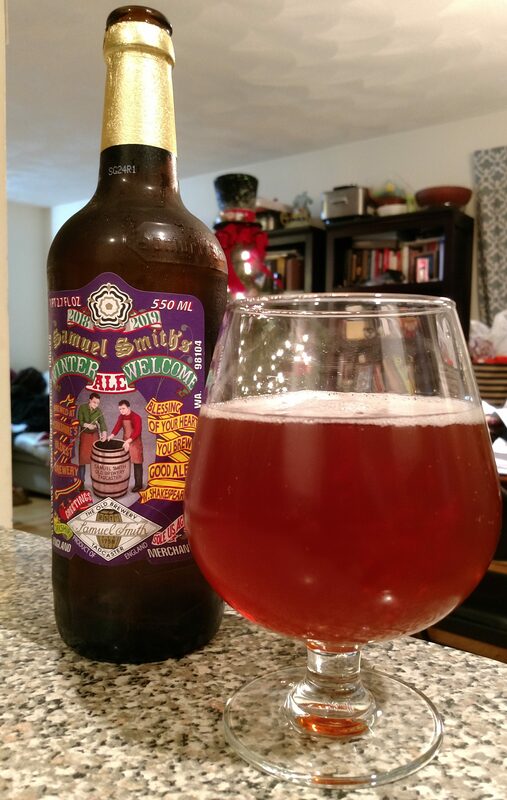 Description: An English-style Barleywine brewed with a “reiterative mash” (i.e.they used runoff from the first mash in the second) technique, this was typically released in the months of November and December to help the locals keep warm. My bottle was from the 11/2015 batch. Appearance: It poured a thick, dark-caramel brown body topped that was topped off by a layer of tan foam. Smell: Sweet aroma of brown sugar and toffee, with a slight bit of heat on the end. Taste: Rich, sweet malts upfront highlighted by a complex blend of caramel, brown sugar, toffee, dark fruits, and butterscotch. A bit of heavy cream came on in the middle right before the beer picked up the lightly toasted dark malts and subtly heat that carried it into the finish. Mouthfeel: Full, creamy body with very low carbonation. Hype: Fond memories. This was very well regarded in its day, but being my last bottle from this brewery I had a special attachment to this as well. I didn’t want to it to go, but I also figured it was time. Overall: Simply fantastic! It surpassed my expectations and I couldn’t have asked for a better final taste of this brewery. 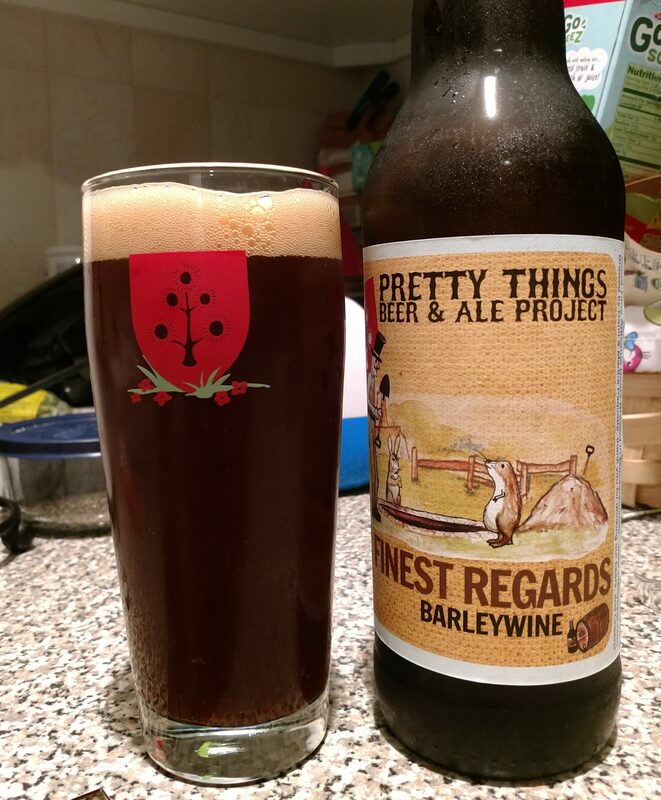 It’s been rumored and teased that Dan and Martha Paquette, the team behind Pretty Things, has been looking to start professionally brewing again in England so hopefully I may someday come across some more of their beer. Cheers to them!